There they were, dozens of pairs of beady tweeter eyes, flared midrange nostrils, gaping woofer mouths – all daring us to say something, anything, good. 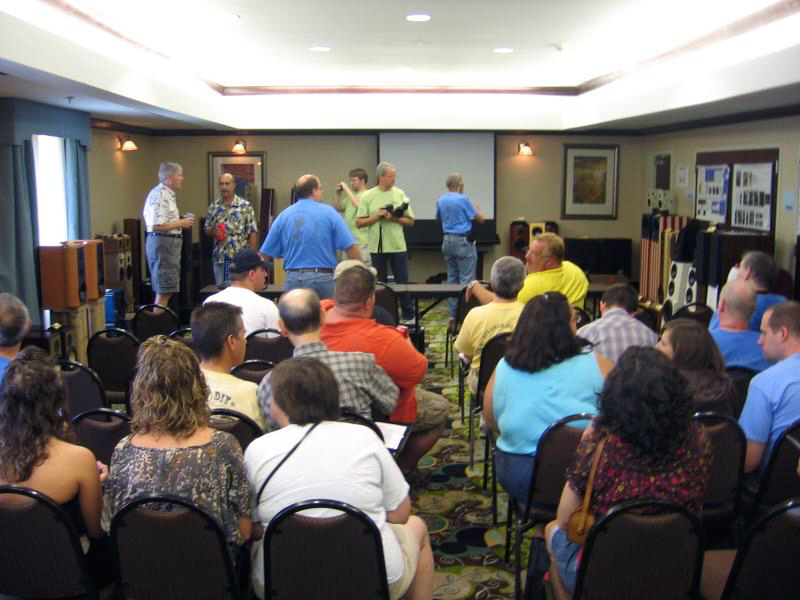 I was trapped in a room surrounded by forty plus pairs of speakers, all waiting to sing and be judged. Some of them hulking as big as a Frigidaire, some so small that two would fit in your hand, others looked like fish or sewer pipes or race cars, Uncle Sam or even a puppet piano face. No kidding. Fortunately they didn't all sing at once! 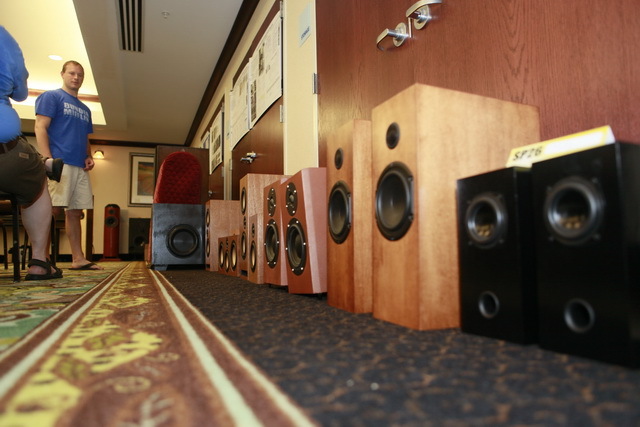 Want to know what it's like to be in a hotel meeting room surrounded by more than 40 pairs of handmade speakers? Just go to the Dayton Speaker Contest sponsored by Parts Express. One thing you'll discover is that it can be a great time! I was one of the three judges for this year's contest. They wanted a representative from diyAudio.com, so yours truly volunteered. Don't believe 'em when they tell you not to volunteer in life, sometimes it can be a lot of fun. The organizing crew was great, the speakers were of a very high level, the builders and participants knowledgeable and friendly, and the beer was cold and plentiful. What more could you ask for? 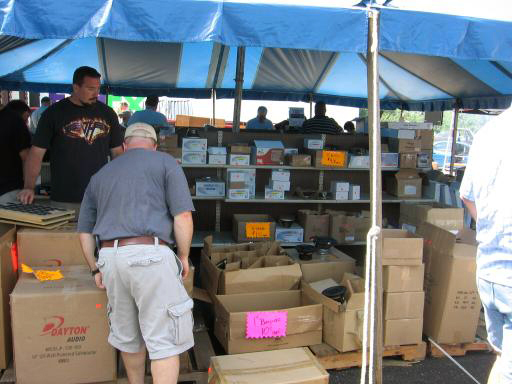 Parts Express, the big audio supply house south of Dayton, Ohio, sponsors this annual gala event that includes a tent sale, speaker contest, car sound contest, demos, and free hot dogs and hamburgers. It is a big place, a really big place, and Dayton manager Rich Taylor gave me the cook's tour of it when I arrived on Friday afternoon. You never know what's behind a website, which is how I'd known Parts Express all these years, but I discovered that this is an impressive operation. There are offices, a showroom/retail space, a call center, web and advertising services, speaker re-coning shop, and a photo studio. And then there are the warehouses. 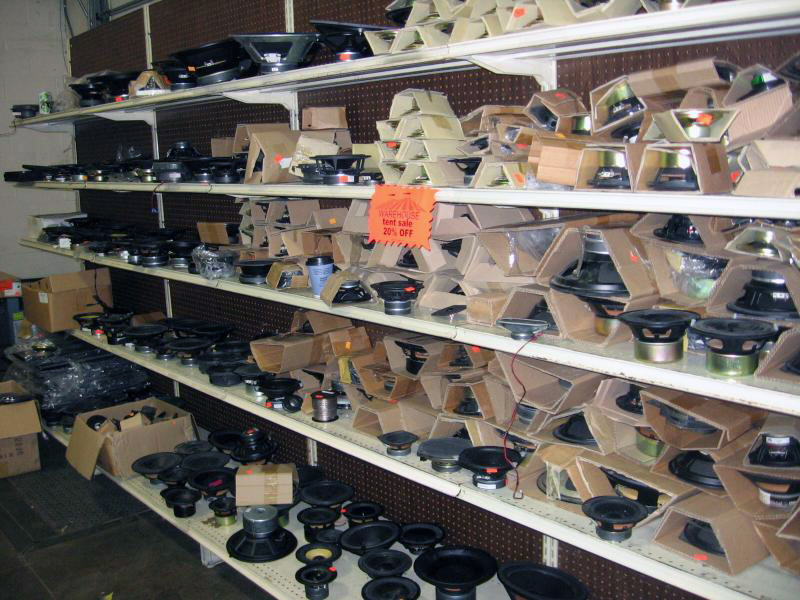 Imagine two Costco warehouses more than full of speakers, cables, parts and accessories. And look! your order is going down the line, getting ready to ship! 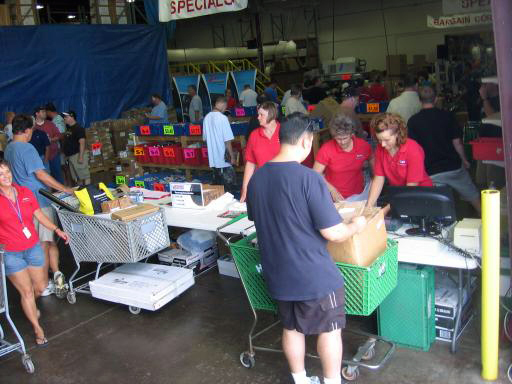 The "pickers" pull that stuff from all over the warehouse and then pack it to ship it out. How they find it all is beyond me, but they are clearly tightly organized. Now back to the contest. 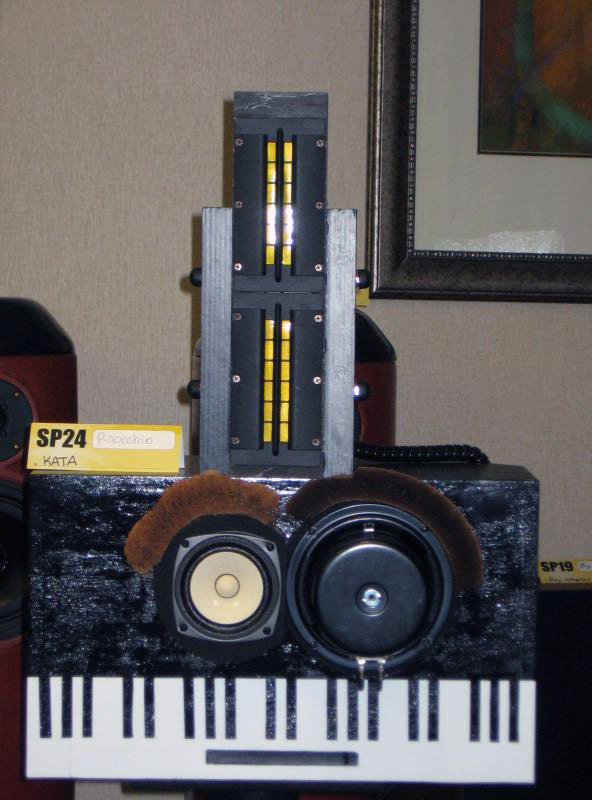 It's open to anyone who builds their own speakers, you just have to register and show up with them. Dayton Audio – you have to use at least one Dayton brand driver. Open Drivers -any brand, any type, less than $200 per speaker driver cost. Open Drivers - greater than $200 per speaker driver cost. Open Unlimited. Speaker Projects that are active or can't be categorized in the other 2 areas. The first three categories were all judged using the same CD player and amplifier, a pro Denon CD player and QSC GX3 amp. The fourth category allowed active filtering and multiple amps. Looking at the speakers, it was hard to know which was in what category. Much of the cabinet work and craftsmanship was so gorgeous that you might think the speakers cost a fortune. Maybe the cabinets and crossovers did, but certainly not all the drivers. There were a nice variety of shapes, styles and technologies; horns, full range drivers, MTMs, planars, tube and TL designs were all present. Most were fully finished, if only in the nick of time. Some were still raw and had provisional crossovers hanging out the back. There was no snobbery among the builders though. One said he finished soldering his project in the car on the way over, which got a cheer. “But I wasn't driving” he added, which got a jeer. The contest was underway at the crack of ten Saturday morning. A nine o'clock start might have been better, considering all the designs to be heard. I was one of 3 judges, and was in esteemed company. To my left was Don Keele, formally of JBL, EV and Harmon International. Jerry McNutt of Eminence was to his left. Me? 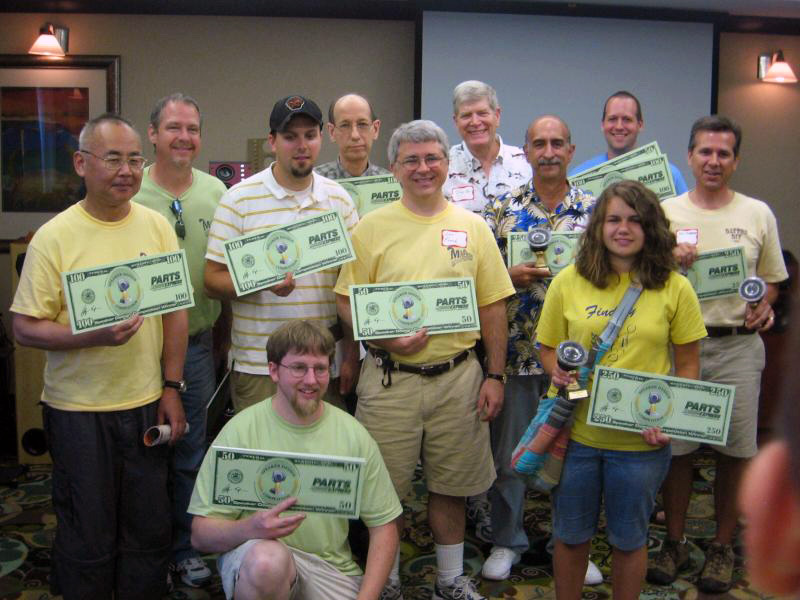 I was just there to represent the average Joe, the weekend speaker builder. Your friendly forum moderator. But I do get around to a lot of shows and meets, so have heard more than my fair share of speakers. Actually, there were additional judges, the speaker builders themselves. Anyone who entered a speaker got to vote in all the categories. If I understand the scoring correctly, those votes carried more weight than the judges votes. The contest started with pink noise to set the levels and then three abridged tracks to judge by. The pink noise levels were measured by the new Dayton system called "OmniMic" which is a combo of a measurement mic and PC software which should be out this year. Tones are supplied via CD. 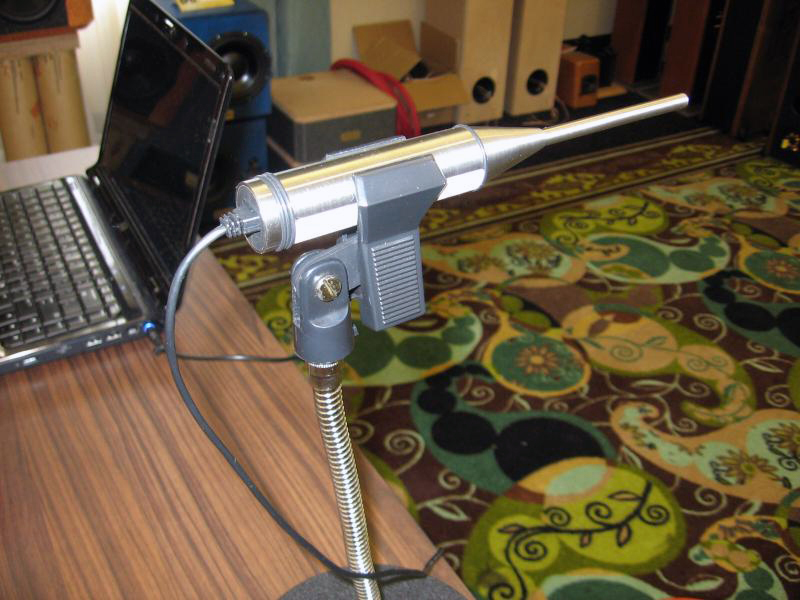 Real plug and play audio measurements. The software is by a person with a lot of experience in the measurement game, though I can't say who. First up was a project from Dayton, an MTM floor-stander that was our reference. Then we were off to the races in the large and varied under $200 category. Mostly small full range, and midsize 2 and 3 ways. Some good, some great. A lot of the full range offerings really impressed me. I'm not a full range driver fan, but some of the designs came close to converting me as it was hard to beat them for smoothness and coherence. That was the largest category with about 13 entries. After a lunch break we headed over to see the tent sale. Wow, what a crazy place! Hundreds of happy shoppers picking up all sorts of bargains, whether they needed them or not. Literally shopping carts full of goodies. Enough to make any audio hound drool. I was happy that I'd flown in, otherwise I'd have gone home with a shopping cart full of goodies too. I didn't even have time to stand in the checkout line, which was too bad as I wanted to load up on those $2 HDMI cables. Eduardo, who had come up from Brazil to represent Selenium speakers, was a wise man and grabbed some. I had a friend stand in line for me with my only purchase, a wall mounted transformer speaker volume control. For twenty five cents how could I pass it up? Then back to the hotel and the contest. Before the next category Don Keele gave a presentation and demo of his CBT line array technology, complete with background info, theory simulations, and very nice charts. Don's curved and shaded line array did precisely what he said it would do: produce uniform power response. Quite remarkable. You can read more about it here: The Official website of D.B. (Don) Keele, Jr. Don is a lot of fun and a very sharp cookie. He may be seventy, but he has the energy and enthusiasm that many a sixteen year old would envy. I encourage you to look at his website, and listen to the CBT if you get the chance, but watch out, Don likes it loud! During lunch, Brian from P.E. brought in a pair of full range prototype drivers that had just returned from Klippel testing. 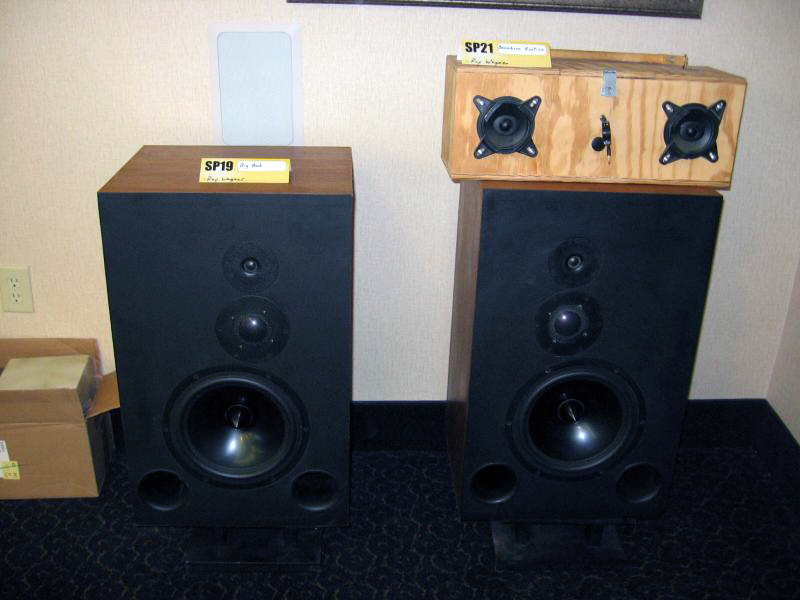 We had heard about them, before, but there they were, Dayton Audio's entry into the high end full range market. They are whizzer cone drivers with phase plugs, strong neo magnets, and both paper and Kevlar cones in 6.5 and 8 inch diameters. All had done very well in testing, so should be on the market soon at under $100 each. These should make the full range crowd very happy and will go by the name "Point Source" under the Dayton brand. The rest of the afternoon was a blur of speakers, speakers, and more speakers. At this point many of them blend together in my memory, but there were some standouts. There were no real dogs (well maybe one) and some really got my attention for their quality. Those that caught my ear did not necessarily win though. 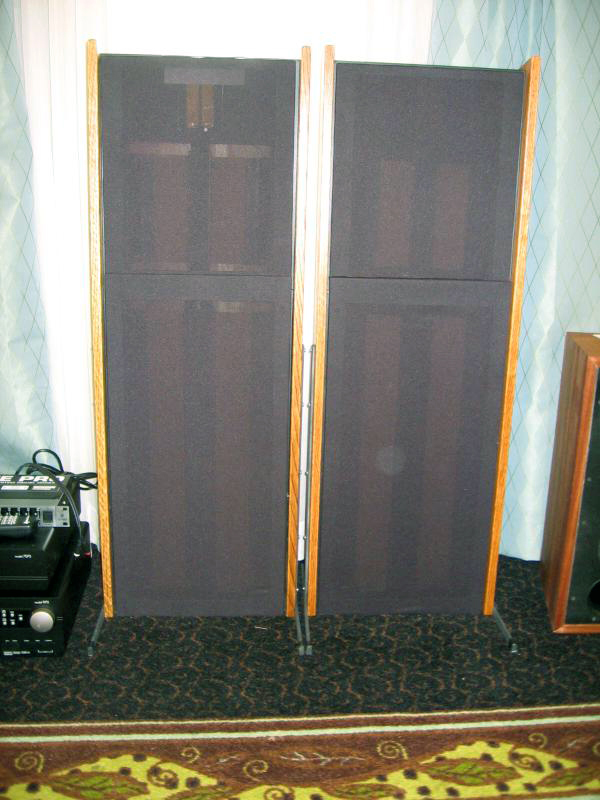 For me the most interesting speaker there was a Planarsonics homemade flat panel speaker brought by L.E. Heavener. Their membranes were cardboard! Suspension appeared to be rubber, and I think the designer now has a patent on them. The test went by way too fast as I did not want to stop listening to them. So clean, so even, so effortless. Supposedly they only went down to 80Hz, but they sounded deeper. That's what happens when the whole spectrum is clean. 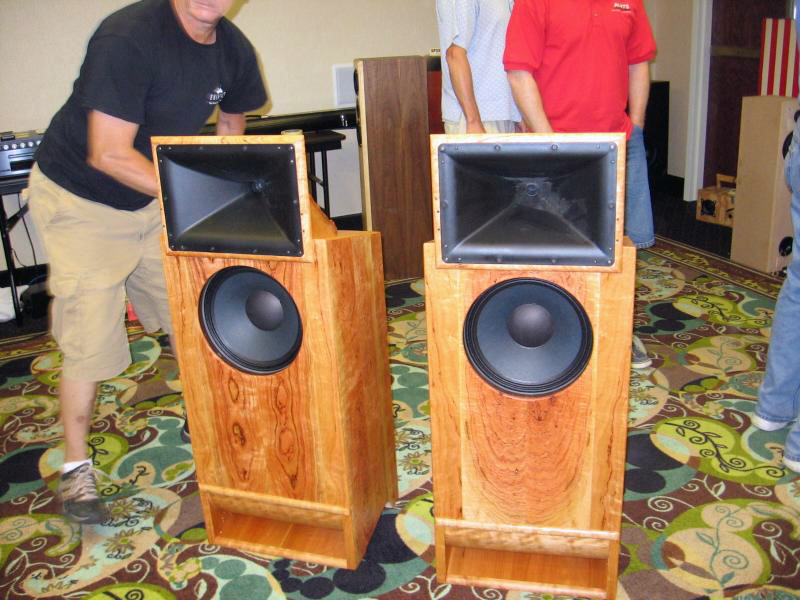 The well known and loved Econowave concept had two entries, one from Bill Waslo using four Dayton mid-woofers instead of a single twelve inch, and another lovely entry from diyAudio's own Ed laFontaine. This was a QSC wave guide powered by a B&C DE250 driver, supported on the low end by an Eminence Deltalite II twelve inch driver. Jerry McNutt didn't seem to take offense at the mixing of Eminence and B&C drivers, even though we ribbed him about it. At least Ed was wearing his Eminence T-shirt. Even claimed that he hadn't spent much time on the crossover. Great work Ed, those have a real future. Sorry you didn't win a prize. The "Big Bobs" entered by Ray Wagner were also very nice. They didn't seem to make a big impression on many people, but I liked them. Good tonal balance and good imaging in what looks like a party speaker from the 70s. Sounded much better though. Yet another standout was the Cancan by Leo Frank. 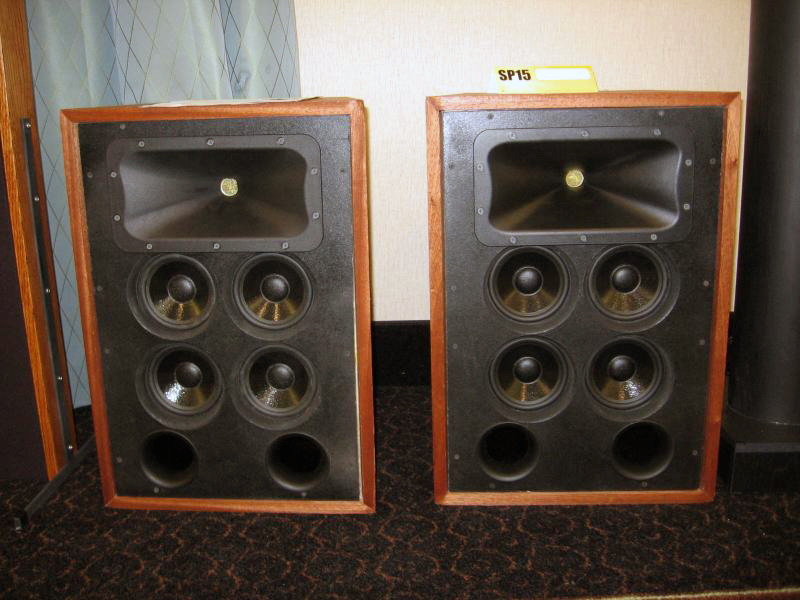 Leo took a set of old Ohm Walsh drivers that he had found on eBay and made a new set of speakers from them. He even designed the crossover himself in Speaker Workshop. They imaged like no other speaker there. I have possibly never heard such precise location and separation of instruments and band members. Between the speakers, you could really hear, almost see, the distinct location of each player. Uncanny, if you'll excuse the pun. 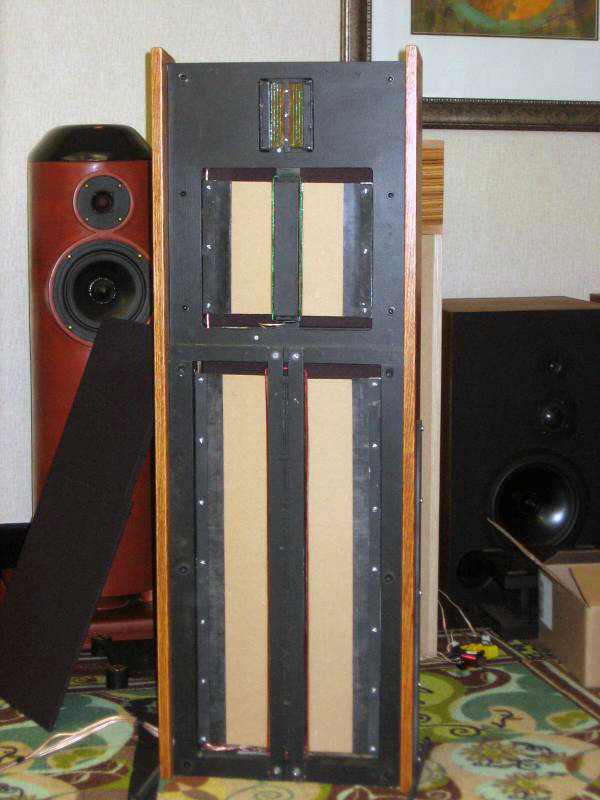 There was some bloat in the mid bass, maybe tube resonance from the woofer, but it did not spoil the image. I'd love to own a pair of them. Previous winner "Kata" Maekawa came all the way from Japan, shipping his P-nocchio speakers before him. 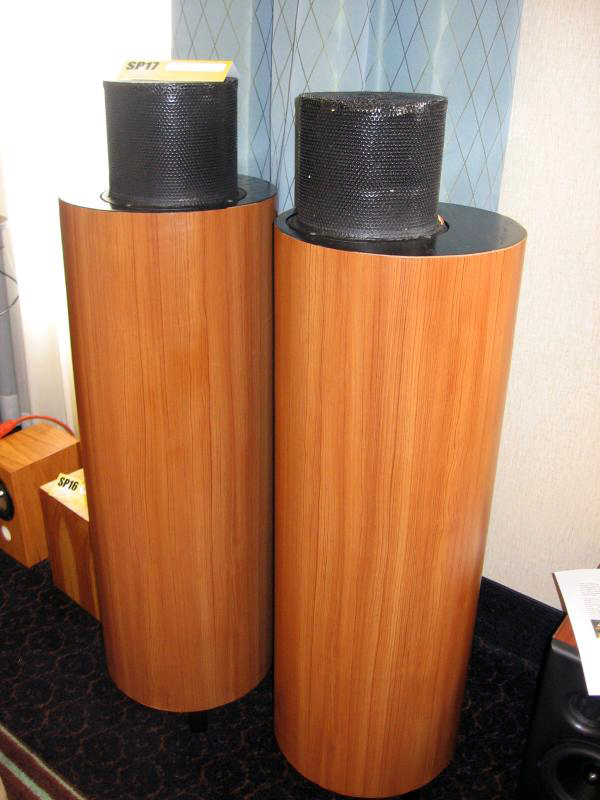 Described by one observer as "the ugliest speakers I've ever seen", they still won a prize. They sounded quite good actually, warm and smooth. That was the thing about this contest and the speakers. Seeing them lined up around the room you had no idea what was going to come out of them, and we were constantly surprised. Jim Griffin, whom most of you here know, brought some lovely MLTLs, two pair. Both were smooth, well balanced and a pleasure to both hear and see. I have even more respect for Jim now. Contest veteran Wolf Shaffer was a busy fellow, with at least three entries of his own, and his hand in many more. He also seemed to be having the most fun of anyone there. I didn't know Wolf before this contest, but was glad to meet him, as he obviously has a handle on this speaker building thing. His "Attitudes" 3-ways were very well designed and built. A very strong effort from a busy designer. Cool finish on the cabinets, too. 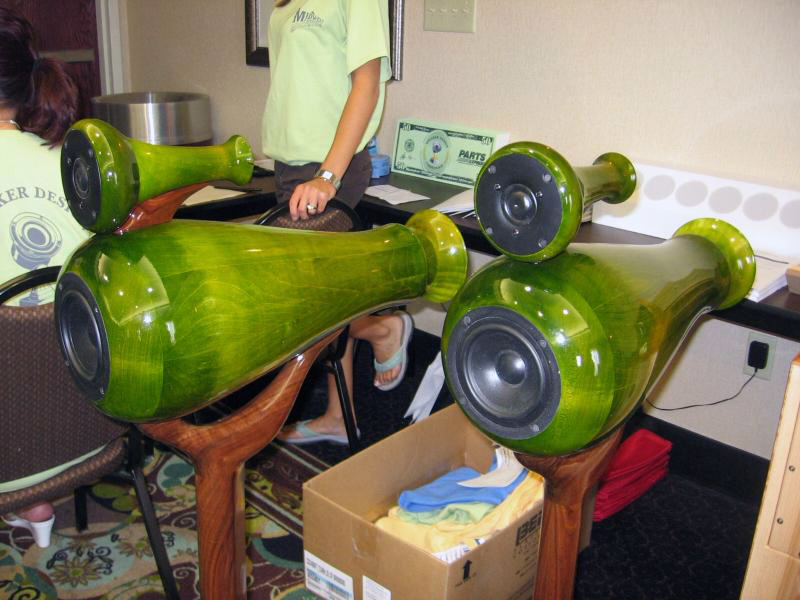 In the line of some of the prettiest speakers I've ever seen were the amazing "green fish", or "sideways vase on a stand" 2-ways. I gave them 11 out of 10 for craftsmanship as these things were like glass. He introduced his speakers with the quip, "Yes, I own a lathe." Last year's winner Ed Froste and his son, Ed Froste, were there in force with some speakers that looked as good as they sounded. The younger Froste brought a pair of what he called the Flames. What a trick paint job! Any Harley would be proud to wear it. 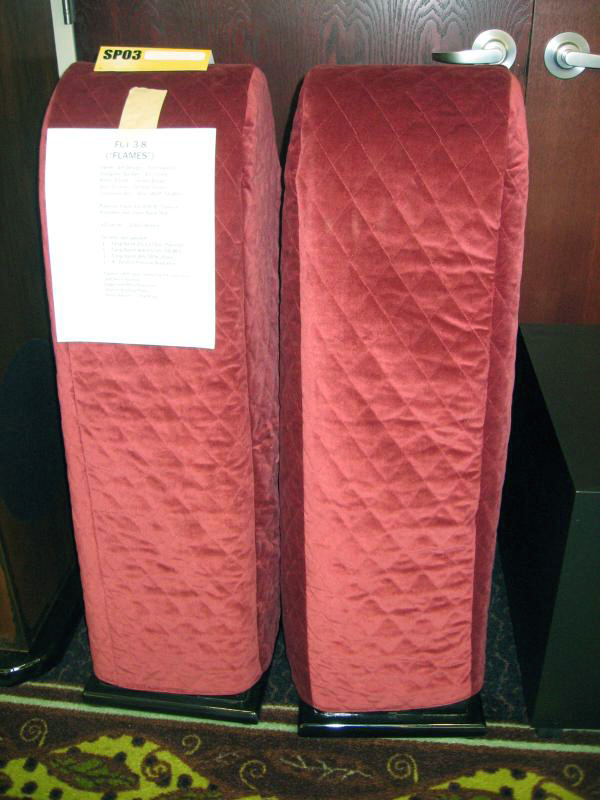 They even had their own quilted covers. Ed's winner from last year had made the cover of the Parts Express catalog. All the votes were quickly tabulated and the winners announced. There were no surprise winners, as the best speakers had gotten the best crowd response so it wasn't hard to tell which way things were going. With that many speakers though it was never a sure thing. The builders were very generous to each other with praise, kind comments, and useful advice. Unfortunately Bogdan Petrescu could not be there to accept his prize for his Born In The USA speakers, as he was taken to the hospital at lunch time with chest pains. His lovely youngest daughter accepted the prize for her dad. News is that Bogdan is doing well. 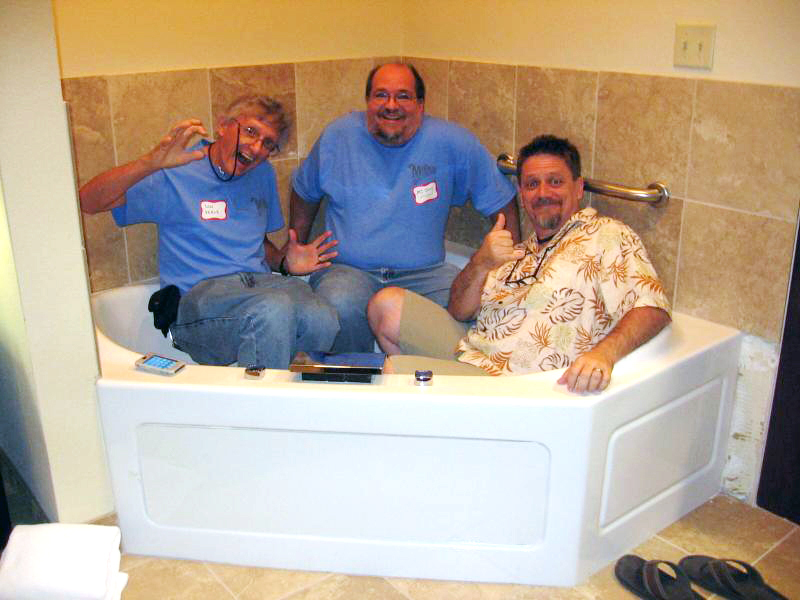 If you are a speaker builder and can get yourself and your speakers to Ohio next year, I highly recommend the trip. The competition is tough, but friendly. There were lots of comments about how the bar is raised each year, that the entries get better and better. 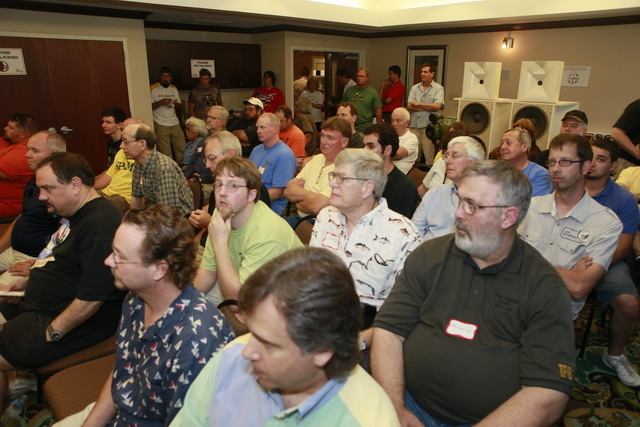 Some of that is due to better drivers and design software, but a lot of it is due to forums like our own diyAudio. Keep up the good work and start planning now, as space may be tight next year. 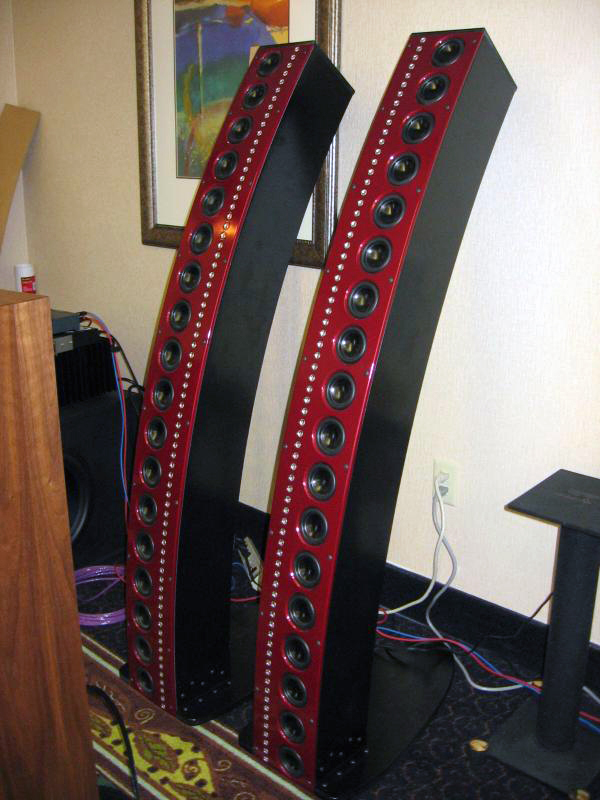 You can only fit so many speakers into an afternoon or hotel meeting room! Last edited by Variac; 1st April 2011 at 11:47 PM. Thanks for coming Michael! A hui hou! 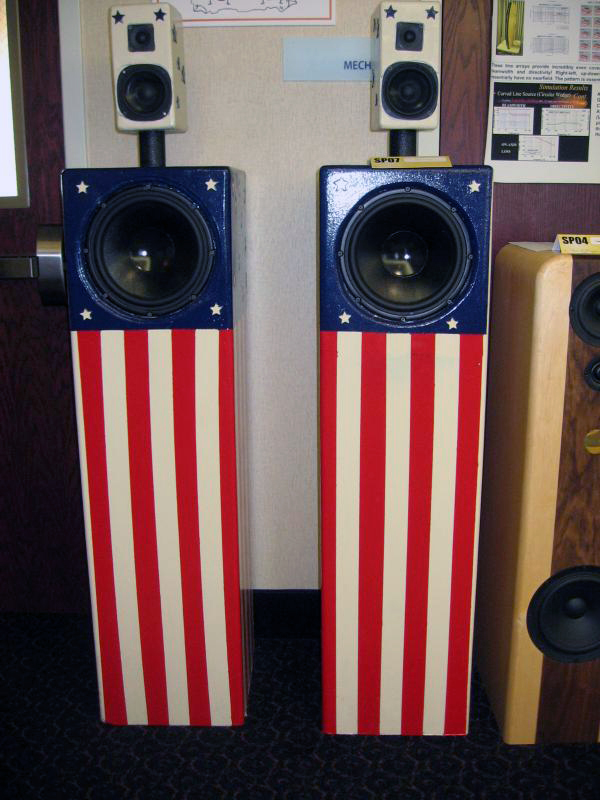 I am very interested in the "Can Can" Speakers by Leo Frank.....Where can i get more information on them? Thanks guys. It was sure fun. You might try the Tech Talk section of the P.E. site. I don't know if Leo is a member here or there, but you can ask. They were really nice. The homemade planars have really peeked my intrest! Alas, I can find no info about them... Looks like a rewarding build though..
You're right, I need to find out more about them. If I do, I'll try to pass the info along. They were very nice and maybe the only speaker there that demanded more listening time. It was good to meet you too, and glad you could make it! Yes- I'm addict, in the worst way. The 'bar' is raised every year, and competition is tougher with more entries as it goes. The Planarsonics seem intriguing from your description. No patent or application found and my searching came up empty. Were you able to glean any other technical details? Coil tyoe? Magnets? No, I never did get much info on them. Sure wish I had. Didn't even get a good look. I'll try to find out more. The surface area doesn't look like much, but they sounded just fine. Something to do with the suspension, I think.